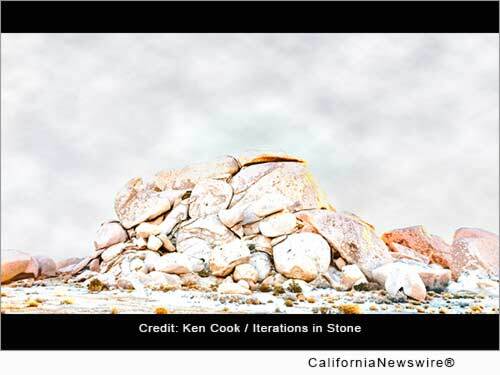 KELSO, Calif. /California Newswire/ — The Desert Light Gallery, located in Mojave National Preserve's Kelso Visitors Center, Kelso California, announces the opening of a new fine art photography exhibit, "Iterations in Stone," (Jan. 4 – March 30, 10 a.m. to 5 p.m. Thursday through Monday, closed Tuesdays and Wednesdays). The exhibit is an Artists in Residence exhibition from art photographer Ken Cook. "Iterations in Stone" includes 18 pigment-on-paper prints derived from a thematic study of a complex rock formation in the Mid Hills area of Mojave National Preserve. These large-scale prints are texturally captivating, but the role of an artist is often to dismantle existing communication codes and reassemble them to present the world with new views. Cook began his Artists in Residence project with a simple premise; photograph a unique formation of jumbled boulders in the Mid Hills area of Mojave National Preserve from the same location and perspective over a years' time under different light, weather, seasons, and atmospherics. The thematic principle also was simple; the body of rock or stones do not change but the world around them and us does. The art study, however, yielded different conclusions, Cook noted. "As expected I captured some variations in the seasonality of the desert light, but other than direction, the light changes little and, of course, the stone does not change," said Cook. "What did change, after making thousands of images and spending hundreds of hours photographing this one subject, was my visual perception of the stone and jumble rock formation." Working alone in the desert, Cook captured images at all times of day and night, an experience that he found had a meditative quality. "Peace comes easily while working the desert light and one can experience nature's harmony, free of life's daily chaos," Cook recalled. Twelve months and thousands of shutter clicks later Cook distilled his collection of images to six key images of moments in time and light. "Sometime during the first half of the year, I realized that I had begun to internalize this unique scene, and as an artist, I had the tools to extend what I saw and felt. I worked from pictorial images and then restated the prismatic quality of the light, the scene texture, and the emotional range which permitted me to create two iterations of the original pictorial scenes." Blazing sun, cool black nights, thin clouds with a promise of rain that never came, skiffs of snow, moon and sunbeams, present more than light, they display nature's harmony free of life's daily chaos. While Cook's pictorial presentations are delicate and nuanced, his iterations are stimulating and seductive as he treats his viewers to his perceptions of reality. Sunlit rocks, foggy skies, early daybreaks and more, evolve into restatements of crisp, stark shadows with defined edges, glows of highlights, or perhaps blue-hour scenes with delicate pools of feathered highlights. The pictorial images tell us about the consistency of the desert but it's the iterations that draw our attention to isolated, significant details. "I leveraged small changes in light into big changes with my appreciation for the desert's consistent peace and solitude," Cook said. "Perhaps one can find these introspective and restorative moments in other places, but for me it was Mojave National Preserve, and this exhibit allows me to share them with our gallery audience." For more information about the Preserve's Artist in Residence program and new Friends' group go to https://www.mojaveair.org/. * PHOTO Caption/credit: "Snow Number 2," by and Copr. Ken Cook.